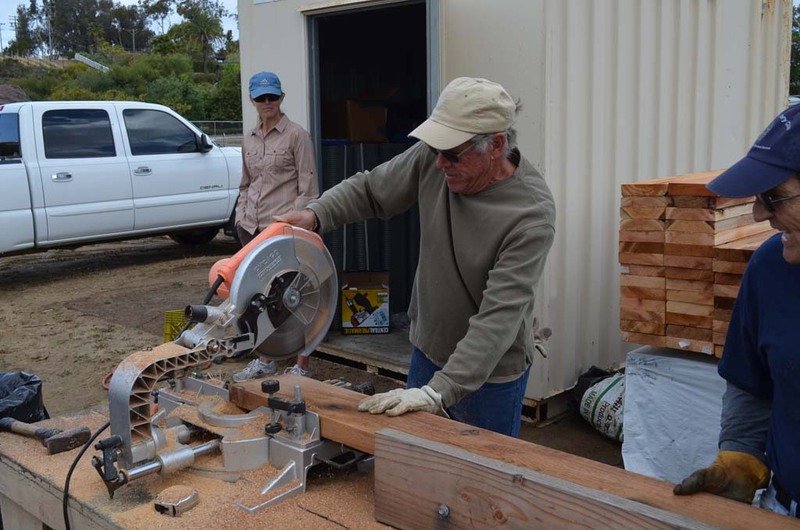 ENCINITAS — Roughly 25 Encinitas Rotary Club members were hard at work carrying wood, sawing and drilling April 26 at the soon-to-debut community garden on Quail Gardens Drive. By the time they called it a day, members had built around 30 raised planter boxes for the garden. 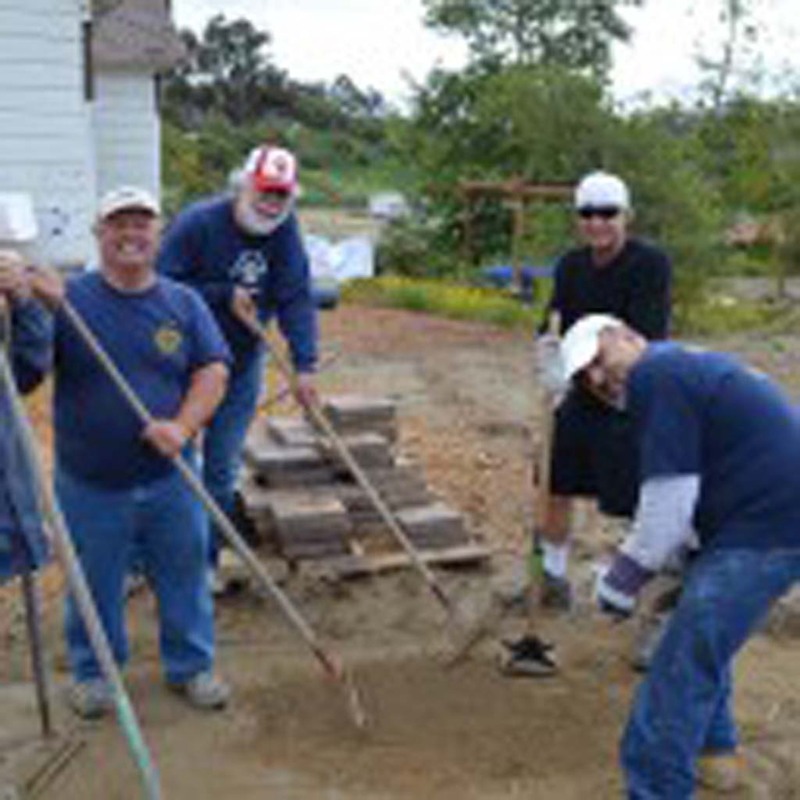 Across the street, rotarians also laid down pavers for an outdoor walkway that will snake around the San Dieguito Heritage Museum. The community garden, part of the EUSD (Encinitas Union School District) 10-acre farm, is expected to open sometime this summer. 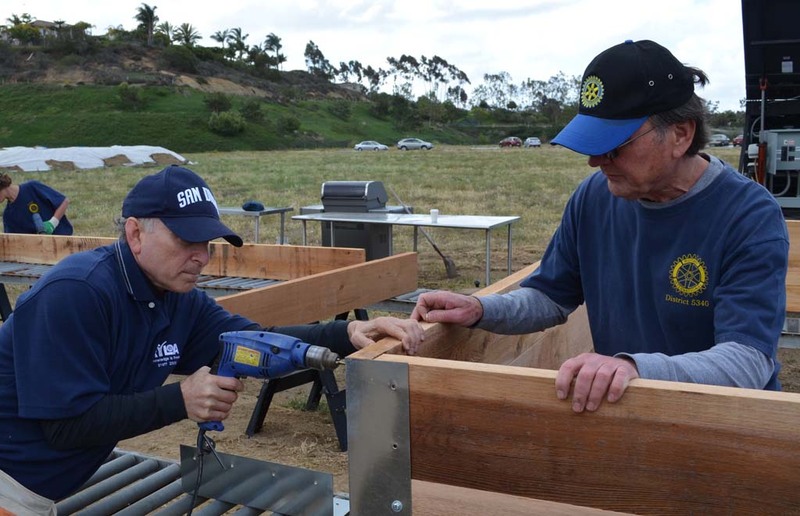 David Lam, president of the Encinitas Rotary, said rotary constructed planter boxes to prep for the launch. “Organic vegetables and fruits will grow in the boxes — it’s exciting,” Lam said, noting San Dieguito Academy Rotary Interact Club students also contributed. 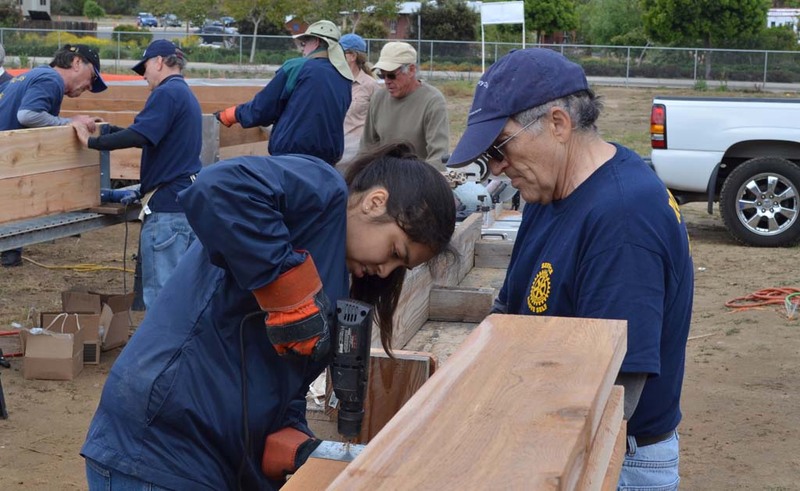 April 26 marked the national day of service for rotary clubs. Lam noted Encinitas rotary picked the garden and walkway projects because they’ll benefit the larger community. Ultimately, around 125 planter boxes, plots in which can be rented by residents, will line the garden. However, until the garden opens, the planters will be stored offsite. Liz Taylor, a rotary member who’s also on the board of the nonprofit Encinitas Community Garden, said residents have searched for space that could host a garden for years. Taylor said finding the right spot was tricky since open space is increasingly rare. But ultimately the Encinitas Community Garden board is glad to have found the Quail Gardens property, she added. “Historically, Encinitas has been an agriculture community; it’s fitting residents should have a place to plant,” Taylor said. She noted those interested in volunteering for the garden should visit encinitascommunitygarden.org. And soon, the website will outline the process for securing a plot. The 10-acre site will feature a district campus, the community garden, crops and space for other tenants. Currently, portable classrooms for EUSD students stand there, but the rest of the property remains undeveloped. Work began on the property last summer, but it’s been hit by delays. Notably, the city withheld a grading permit due to questions over site drainage. Also, EUSD originally planned to lease much of the site to Eat Well Group, which in turn would have leased to subtenants. However,EUSD Superintendent Tim Baird, a rotary member who was on hand constructing planters, said the district recently opted to retain control of the site and issue leases. Organizations specializing in agriculture and alterative energy lessons would likely rent space there, he noted. That new approach means EUSD must overhaul a master plan for the site. Baird expects the plan to go before the district board of trustees for approval at the end of May. The district portion of the site will likely launch in the fall, allowing students to plant crops and learn about the growing cycle, Baird said. As for the community garden, Baird said infrastructure for water and utilities must still be installed on that side of the property. But he added it “definitely should” open by summer. Proposition P, a $44 million bond passed in 2010 for facility and technology upgrades, is funding most of the farm development. 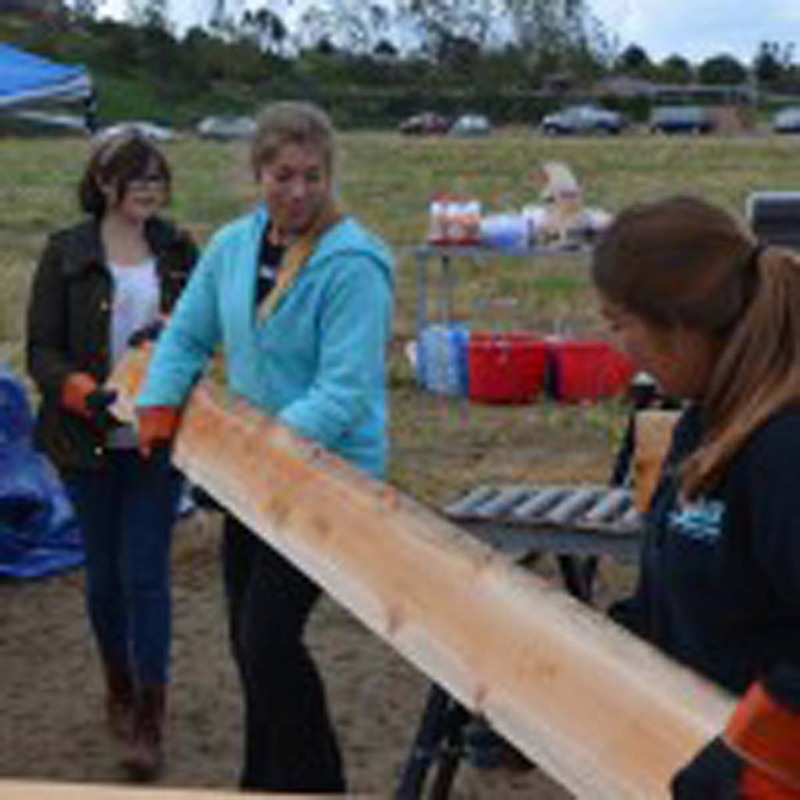 Much is also happening at the neighboring San Dieguito Heritage Museum, and so rotary also leant a hand there. Presently, residents can peruse outside exhibits, ranging from an old-time stagecoach to a 1950s fire truck. New exhibits are planned, including a re-creation of 1940s downtown Encinitas and a 4,000-square-foot barn that will contain old documents for researchers to leaf through. To give visitors a clear path to walk on and to beautify the museum, rotarians started construction on an outdoor walkway. Dampness from the previous night’s rain stalled their progress, but members will finish it up in the near future. “We’re more than happy to help the museum,” Stone said. 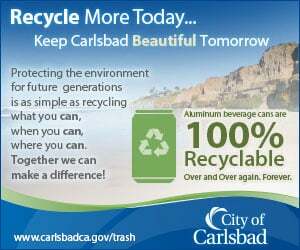 He also encouraged residents to attend the rotary’s annual Deep Pit BBQ at the museum May 17 (tickets can be purchased online at sdheritage.org.) At the event, Encinitas resident Doug Long will receive rotary’s Living Heritage Award for over 40 years of service. 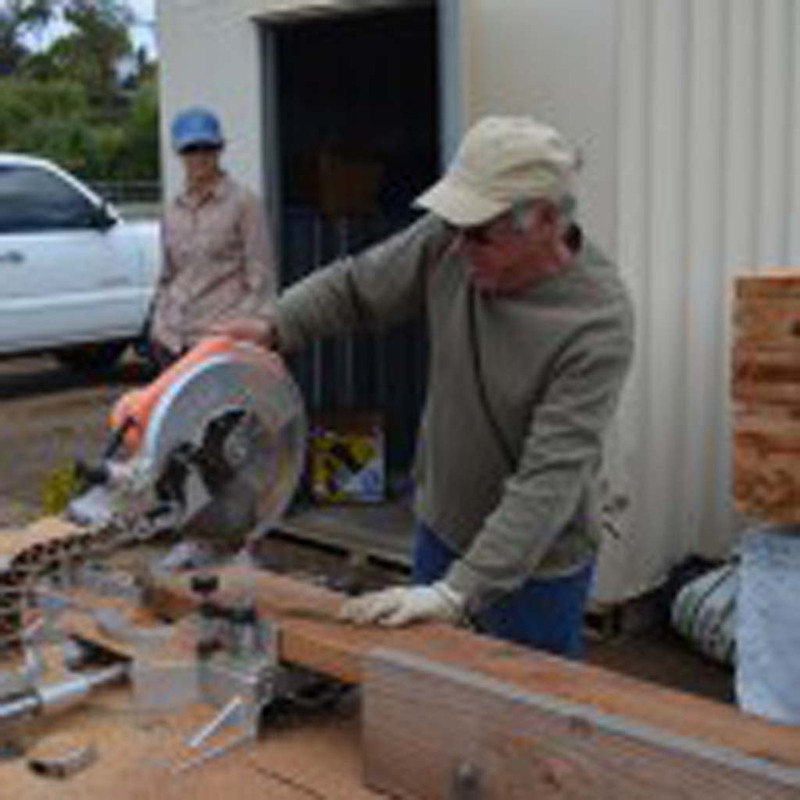 Mike Murphy takes a buzz saw to wood for a planter box for the Encinitas Community Garden. 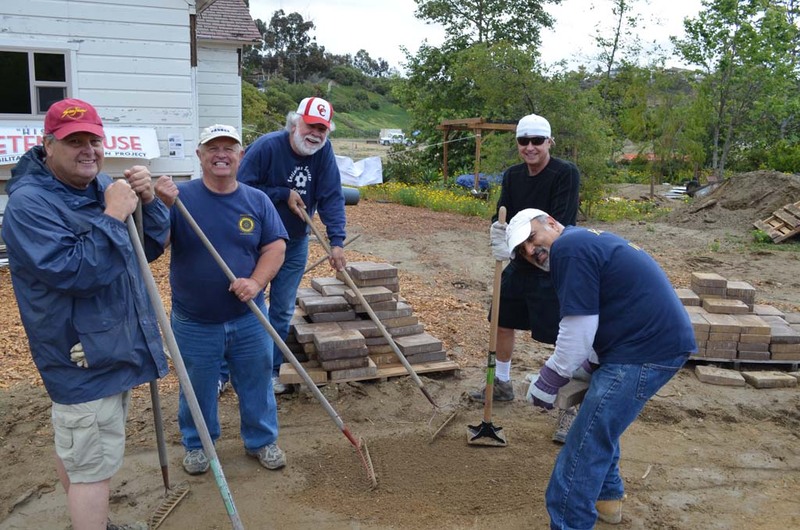 From left to right: Dan Daniels, Ralph Stone, Mike Walsh, Dean Goetz and Rodger Bolus work on a walkway at the San Dieguito Heritage Museum. The museum is adding exhibits. 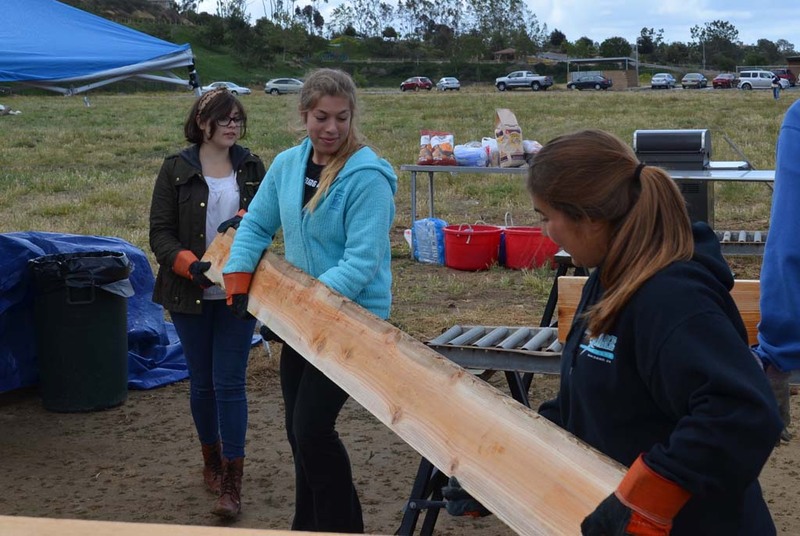 Left to right: Gabriella Garruto, Julia Ramzi and Maria Lopez move a wood slat that will make up a planter box. Rotarians work on a planter box.